With the increasing popularity of special-interest river cruising, wine-themed river cruises offer a new twist on a beloved classic. These increasingly popular epicurean itineraries are taking the market by storm, according to our counsellors, who have been boldly venturing forth to experience them first-hand. Here are two recommended vacations from the experts at Maritime Travel – the first is a flavorful foray through the vineyards and culinary centers of Paris and Normandy and the second is a wine-lovers sailing along the stunning Danube River, with port stops in Austria, Germany and the Czech Republic. 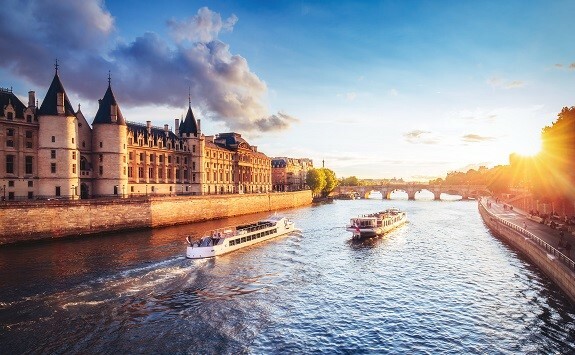 From the glamour of Paris to the stunning coastline and incredible food of Normandy, the 7-day Paris and Normandy Wine Cruise with AMA Waterways offers a cornucopia of culinary delights and sensory experiences. AMA wine cruises also offer a range of exciting epicurean tours and excursions; you’ll also be treated to unlimited, specially selected local wines during lunch and dinner. These change daily and are paired with locally-inspired menus. Since this is a cruise with a foodie theme, there’ll be culinary treats and tastings throughout, including an exclusive onboard food and wine-pairing dinner hosted by a Master of Wine, while docked in Passau, Germany.